Meet the supporting cast of 7 Days of Pie. People in Memphis: if you like to cook, like the feeling that you're getting a 'deal,' and want to have a good time, head on down to Lit Restaurant Supply on Union Avenue. Boy howdy, that place is great. 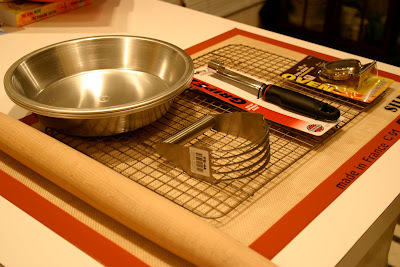 Above, you will see three metal pie pans that are 2" deep, an apple corer, an oven thermometer, pastry cutter, French rolling pin, the beloved cooling rack, my pie folder, and [drumroll please]... a new Silpat! 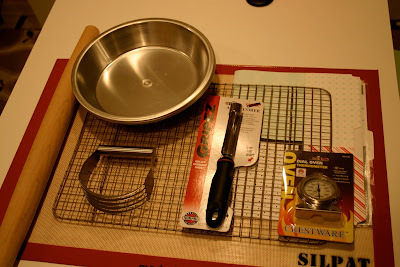 Pastry cutter, pie pans, thermometer, and apple corer all came from Lit. [If I'd had more time and more Benjamins, more damage may have been done.] But, from all that I've researched on the Chosen 7 recipes, these goodies, along with my other baking items (parchment paper, measuring cups, double boiler, juicer, etc. ), should do the job. Check in Monday for Pie Adventure #1. Too bad I already know all the pies and it won't be a surprise for me. Oh well, I like being your sister too much, and that equals knowing everything. BAA HAA HAA! i'm ready for this...can i be a taste tester? I absolutely love my apple corer! I use it 2-3x a week! Um, you're forgetting a very important item: You must rent "The Waitress" during your 7 Days of Pie. A must.